In this section we discuss the mysterious orbs and other phenomenon that have been seen by many eyewitnesses in and around crop circle formations. Until 2000, these people were usually called crazy even by their peers when discussing these orbs. This all changed, however, the Dutch physicist Dr. Eltjo Haselhoff published his research results in the scientific journal Physiologia Plantarum. 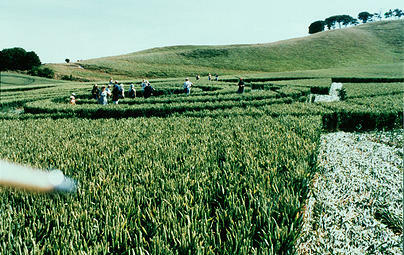 Haselhoff’s research on the nodal extensions in crop circles appeared to meet all the academic criteria required for proof and with his publication in Physiologia Plantarum (October 2000) was accepted by the scientific community that the crop circles Haselhoff had investigated were derived from electromagnetic point sources (ie by orbs) of unknown origin. (A comprehensive overview of Haselhoff’s work and other scientific research crop circle can be read in part 2 of Dr. Janet Ossebaard series of books: “Crop Circles – Proof”). 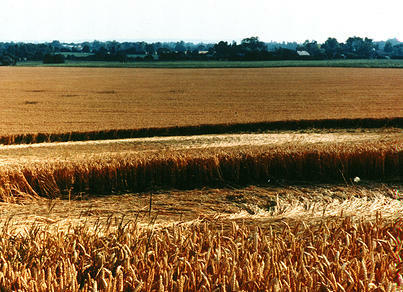 The numerous witness accounts of light orbs near crop circles was from that moment validated. Their stories had finally been given backing by the scientific community. Lights that can not be seen with the naked eye, but which appear on photographs and in film. A well-known phenomenon where the lights or orbs are not visible to the naked eye, but which appear on photographs and film footage. Several books and DVDs have been devoted to this phenomenon, such as the excellent Orbs and Other Light Phenomena by Ed Vos (Publisher Ankh Hermes) and Orbs, the Veil is Lifting of Hope and Randy Mead (Beyond Distribution). With the advent of the digital camera, the term “Orb photography” has become a hobby for many. Since the pictures checked after the fact directly on the LCD display of the camera, it no longer matters how many shots you take. The past years of costly rolls of film being expended to capture good images of orbs are long gone. Many know that sometimes orbs appear in photographs and films that were not seen when the images were taken through the viewfinder. For years we at circular site have studied this strange phenomenon. Investigating the influence of weather (temperature, humidity, season and rainfall), the lunar cycle, the presence of dust, insects, precipitation, as well as the difference between the camera when it uses flash, an analog or digital image, etc. In short, the following conclusions can be drawn from this information. The lights and orbs appear on both analog (old-fashioned pictures and slides) and digital images alike. There’s no bias towards one or the other. We have included some sample images on this page that show the phenomenon. 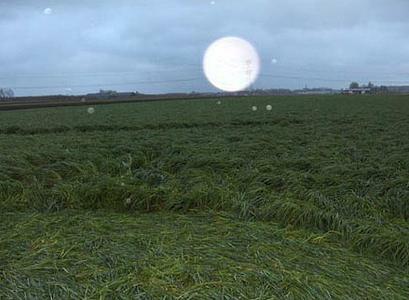 These strange lights were photographed in crop circles with both analog and digital cameras.